"The strengthening of visible communion between the Church in China and the See of Peter". We are very grateful to His Holiness for keeping China in his open agenda repeatedly. Within one year, he has publicly declared at least three times his fatherly love to China. "I am especially close to those who have remained faithful to Jesus Christ and to His Church in the midst of difficulties of all kinds, and continue to testify, even at the cost of deep and prolonged suffering, that the principle of communion with the Successor of Peter...cannot be renounced by a Catholic who desires to remain such and to be recognized as such." "Genuine love...cannot be separated from truth...Unity springs from conversion of the heart and from a sincere acceptance of the unchanging principles laid down by Christ for his church...A Catholic who wishes to remain such and to be recognized as such cannot reject the principle of communion with the successor of Peter." 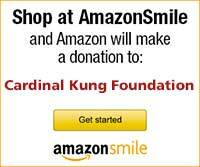 We now have the mission intention for China directly from our beloved Holy Father. Thanks be to God. In China, there is only one Catholic Church which is the Church founded by Christ, One, Holy, Catholic, and Apostolic. This is commonly known as the loyal, suffering, underground, clandestine, or unofficial church which has been persecuted since 1949 when China turned Communist. The faith of this underground Catholic Church and the visible communion between it and the See of Peter are so extraordinarily strong that it sustained 45 years of persecution from the Chinese government. However, this faith and communion is not achieved without a heavy price. All church properties were confiscated by the Government. 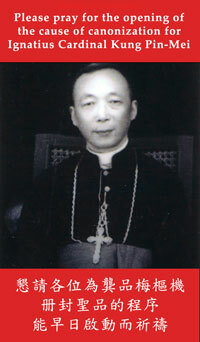 Many bishops, religious and faithful died as martyrs while many others such as Cardinal Kung, Rev. Francis Tsai, S.J., and thousands of other unsung heroes live as "dry" martyrs spending 5, 10, 15, 25, 30 or more years in jail for Christ. Many critics of the underground Church feel that those persecuted, in speaking about its persecution, is, in fact, refusing to relinquish their past sad experiences. These critics regrettably insist on ignoring the current continuous persecution of the underground church. Even today, many underground bishops, other religious, and lay persons are repeatedly arrested, interrogated, and harassed. Elderly religious live in appalling substandard conditions. The faithful must endure constant threat of arrest or fines of up to 5,000 Chinese Yen (US $625), equivalent to a poor villager's income of 2 years, should they be arrested for attending unauthorized religious activities, such as a Mass celebrated by a loyal Catholic priest. The faith of the underground church and its unwavering fidelity to the See of Peter is a model for every Catholic community in the world. However, faith needs to be nurtured and strengthened through continuous prayers, particularly when its path is beset with obstacles and thorns. In this sense, we believe, the Pope has asked, in his August intention, for the universal church to keep the persecuted Church of China in its prayers. Holy Father also appears to specially remember our other Chinese Christian brothers and sisters, who, unfortunately, in the face of adversity, has weakened and wavered in their Catholic faith, choosing to deny the supremacy of the Holy Father and following the Patriotic Association. They may attend the rites of the Chinese Catholic Patriotic Association (CCPA), but are not necessarily staunch Patriotic Association members. They recognize the Holy Father as the supreme authority of the Church in the heart, but lack the courage to declare it. For fear, for physical security, financial advantage, educational / career opportunities, privilege, or ignorance, they compromised their faith by accepting the leadership of the Patriotic Association rather than their Vatican appointed Bishops. They are the "middle of the roaders". The Holy Father asked us to pray for "the strengthening of visible communion between the Church and the See of Peter" which will give this group of the "middle of the roaders" courage to return to the One, Holy, Catholic, and Apostolic Church. Some Patriotic members, including bishops of the Patriotic Association, are Catholic scholars. Yet, they openly reject the supreme authority of the Roman Pontiff. Their loyalty to the CCPA won them approval and appointment as leaders of the CCPA. A well known CCPA Bishop, Aloysius Jin, communist appointed bishop of Shanghai, once affirmed his commitment to autonomy from Rome by expressing that "the church in China and the Roman Catholic church are like the divine persons in the Trinity: equals. (Did he notice that this sounded like blasphemy?)" ( Interview with the Asian Catholic News Agency in Shanghai, page 74 of THE CATHOLIC CHURCH IN CHINA, by L. Ladany, copyright 1987 by Freedom House). In spite of the repeated public declaration of autonomy from Rome, Bishop Jin was recently introduced by a Maryknoll priest , Rev. L. Flynn, to the US. bishops as a "loyal son of the Church"! These Patriotic Association leaders (i.e. Fu Teshan, Zong Huaide, Jin Luxian) are hard-core supporters of the CCPA. It is unlikely, therefore, that any true visible communion exists between these bishops and the Holy See. One cannot strengthen something from nothing. Conversion, not strengthening, of these Patriotic Association loyalists will be needed. Always patiently hoping for the return of these clergy to the One, True, Catholic and Apostolic Church, His Holiness showed His immense love by saying "strengthening of visible communion between the Church in China and the See of Peter". We believe that the conversion of these obdurate members of the Patriotic Association is the real intention of the Pope's August mission intention. Whatever were their reasons, these Bishops, by denying the supreme authority of the Pope, would automatically cut themselves off as members of the Roman Catholic Church. We have the responsibility to pray for the return of these Christian brothers and sisters. We must increase our prayers so that they may have the grace and the courage to acknowledge their faith, in spite of the fact that showing visible signs of communion between themselves and the See of Peter would undoubtedly bring much displeasure from the communist government. "May they sail smoothly on the bark of mother church with St. Peter at its helm, and return home to the Universal Church ruled by our sovereign Pontiff." (Pastoral letter issued by the underground Chinese Bishops' Conference) Through your prayers and that of the Holy Father, the dream and motto of His Eminence Cardinal Kung "One Fold and One Shepherd", which is also the vision of Christ, will come to reality.